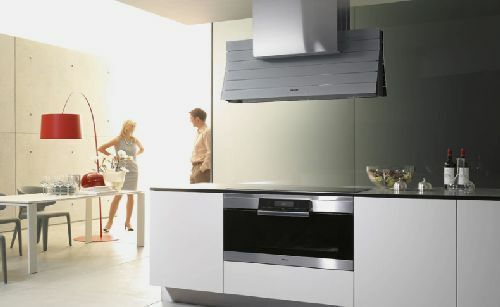 Miele has a new line which can rival the best of kitchen appliances right now. Their series features upgrades to a range of ovens, warming drawers, coffee machines, and microwaves. The ovens have been made larger but will still maintain the design integrity of your kitchen. They now have a capacity of 66 liters a 30% increase of their previous H4000 series. Their new microwaves are now at a capacity of 43 liters. Lets you know, they mean business when they do upgrading. The new H5000 Ovens feature a moisture plus function which automates the water intake that is converted to steam, can store over 20 recipes and has a touch display. The items in this series are space saving and all match each other, giving you a uniformed stunning kitchen. Learn more about the H5000 series at Miele. This entry was posted on Thursday, August 7th, 2008 by HDF and is filed under Appliances. You can follow any responses to this entry through the RSS 2.0 feed. You can skip to the end and leave a comment. Pinging is currently not allowed. Hello, what model hood is that? I haven't seen it in any of the Miele's catalogs?